The extract "Sobre el propio aprendizaje y las técnicas | On my own apprenticeship and technique..." marks the beginning of the publication on scalae.net of the contents of the monograph on Rafael Moneo first published in 2003 by scalae. 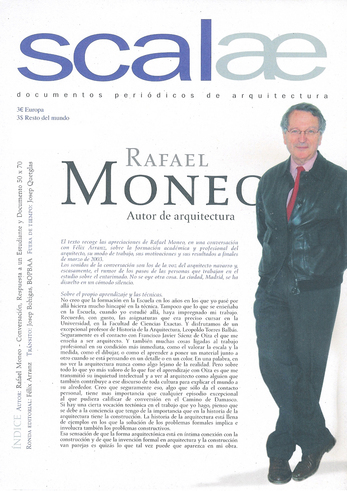 Es posible incorporar nuevos artículos, opiniones o anotaciones sobre Rafael Moneo, sus propósitos personales o sus trabajos profesionales como arquitecto, en el canal de participación abierta de scalae.net: envíar las propuestas* a ebooks@scalae.net de modo que, una vez aceptadas por el consejo editorial, podrán ser publicadas en la red y optar a su inclusión en el correspondiente volumen ...about de la colección de ebooks de scalae. We welcome new articles, opinions, or comments on these conversations with Rafael Moneo, his personal work, or his professional work as an architect. Proposals* should be sent to ebooks@scalae.net -if accepted by the editorial board, texts will be published on the scalae.net site and may be included in the appropriate ...about volume of the scalae ebook collection.